Last week Eniram announced at Gastech 2014, the world’s largest LPG, LNG and natural gas event, another advanced fuel-saving product based on the established Eniram vessel platform. 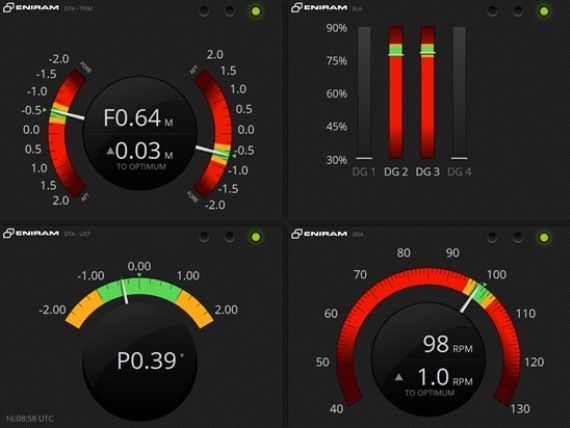 Commenting on the announcement, Mr Pyry Åvist, VP Marketing, Eniram, said: “Eniram Vessel Performance Manager (VPM) is a comprehensive energy management tool that will allow users on LNG carriers to analyze and track the total energy eﬃciency of their vessel in real time. In addition, the system is deeply integrated with other Eniram products to oﬀer actionable guidance to vessel crew. Mr Åvist continues: ” In order for us to give optimization guidance, we had to develop a method to model the world’s most complex vessels, which now enables us to track & predict critical areas such as boil-off”. VPM for LNG provides an easy way to compare two variables with each other to understand their relationship. On the VPM for LNG indicator panel, the most important data related to Navigational Efficiency, Environment, Energy Efficiency and Cargo Management can be seen at one glance. Eniram Vessel Platform (EVP) is Eniram’s 4th generation real-time data collection platform: by collecting and analyzing data from onboard, EVP helps build up intelligence on the operational effectiveness of vessels and gives the shipping industry a foundation to optimize fuel efficiency. Collection of the most critical data for LNG operators and owners such as boil-off and reliquification plant efficiency. 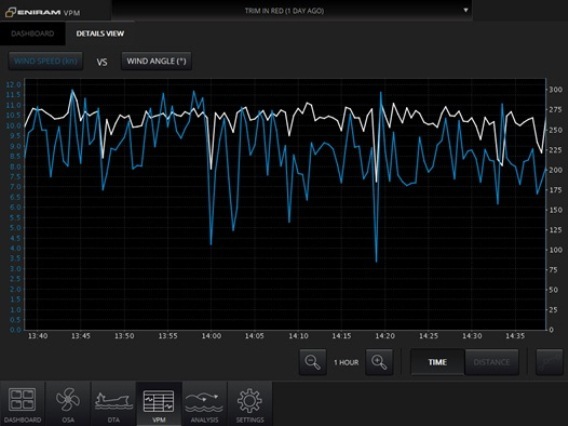 Oﬀers the possibility for onshore analyses of one vessel, as well as the possibility to compare the energy management performance on several vessels or on the entire ﬂeet. Constant performance evaluation. 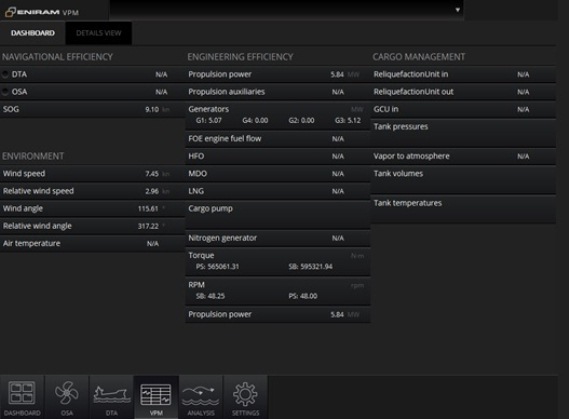 Main dashboard view to oﬀer an easy way for the crew to have a holistic view of the vessel’s energy management. Normalized Key Performance Indicators. VPM presents a set of normalized KPI for key energy consumers which allow direct comparison and tracking of energy eﬃciency operation on-board interdependent of operational area, season or cargo loading. These KPIs allow true comparison and tracking of diﬀerent energy initiatives. Intuitive graphical interface. The intuitive graphical dashboard shows in a holistic way the main energy producers and consumers in one screen. Users can access the detailed graphical view on one click to further explore the behavior of a speciﬁc component and compare it to another component in the vessels energy management system. Eniram is the fast-growing Finnish provider of energy management technology and data analytic services to the shipping industry.